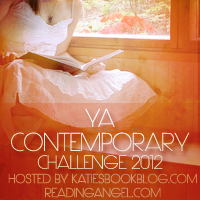 I decided to do some reading challenges for 2012, because I didn't do any this year. They sound really fun, so I can't wait to get started! I'll start off with a few challenges that I'm entering, and if I enter more I will add them on later. Next, I'm entering the 2012 TBR Pile Reading Challenge because there are definitely a lot of books I would like to read that are in my TBR Pile, so this challenge could help me finish them. I'm starting with 1-10 and move up as I go along if I want to. I'm not going to make a list yet, I will probably just do a wrap-up post. I'm starting with these challenges and then see what other challenges I want to enter. What challenges are you entering? When Nora Grey and Patch are forced together as lab partners, Nora would rather fall to her death than put up with his elusive answers to this questions, his teasing, and his infuriatingly handsome face and hypnotizing eyes. It seems Patch was put on earth just to drive her crazy. But before long, Nora's defenses start to break down as her curiosity about Patch heats up. Why does he always seem to be wherever she is and know exactly what she's thinking? How does he know what to say to both attract her and repulse her? And what is up with those V-shaped scares on his chiseled back? As their connection grows stronger, Nora's own life becomes increasingly fragile. Nora needs to decide: Is Patch the one who wants to do her harm or the one who will keep her safe? Has she fallen for one of the fallen? I LOVED THIS BOOK! When I first got it, I wasn't sure if I'd like it or not, thinking it might be like all the other paranormal series out there right now, but it wasn't. I had a lot of trouble putting this book down, it sucked me into the plot right away. I had heard a lot of great things about this book from other bloggers and I'm definitely glad I read it! Plot- The plot in this book was amazing; there weren't any slow moments and I enjoyed every part of the book. I couldn't put it down, it was so addicting. It has the perfect amount of action, romance, and suspense and you will get hooked on it as soon as you start reading it, like I did! Characters- The characters were pretty good in this novel, I wasn't blown away by them. But, I wasn't terribly disappointed in them either, they were just okay. I felt that Nora's character was a little too safe and cautious at times, but I get where her choices were coming from. I get she was being practical and trying to do what was best for her and her safety, so that wasn't too much of a problem for me. But, Nora's best friend, Vee, was annoying to me. If I was Nora, I would have gotten rid of this girl as my best friend right away. I didn't think she acted like that much of a friend to Nora, and was very self-centered. I loved Patch, even if he was dangerous. He was a great character, but I didn't learn much about him during the plot, so I'm hoping his character is elaborated more in the sequel. I think my least favorite character was Elliot--I didn't like him from the start of the book. I thought he was cocky, and by the middle I absolutely didn't like him. Overall, I thought the characters were pretty good. 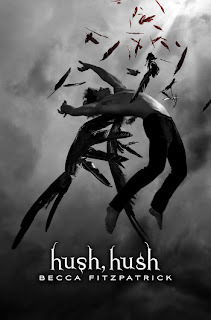 Writing- I thought Becca Fitzpatrick's writing was amazing in Hush, Hush. Her descriptions were great and I loved the world she created here. She developed the characters excellently, but I'm hoping she develops Patch's character more in Crescendo. There isn't much for me to say here, except that I loved Becca's writing and that's it. Cover- The cover is beautiful, it draws me right into the book. I like the colors and how on my copy it's sort of sparkly. This is probably one of my favorite covers on a novel. I can't wait to get Crescendo, the sequel to Hush, Hush! I loved this book, so I'm hoping that the next one is as good as this one! First Sentence: Chauncey was with a farmer's daughter on the grassy banks of the Loire River when the storm rolled in, and having let his gelding wander in the meadow, was left to his own two feet to carry him back to the chateau. 1. Plot: 20 out of 20 points. 2. Characters: 13 out of 15 points. 3. Writing: 20 out of 20 points. 4. Creativity: 15 out of 15 points. 5. Originality: 9 out of 10 points. 6. Ending: 13 out of 15 points. 7. Cover: 4 out of 5 points. Equals: 94. 94-96 is an A.
Becca Fitzpatrick grew up reading Nancy Drew and Trixie Belden with a flashlight under the covers. She graduated college with a degree in health, which she promptly abandoned for storytelling. When not writing, she's most likely prowling sale racks for reject shoes, running, or watching crime dramas on TV. 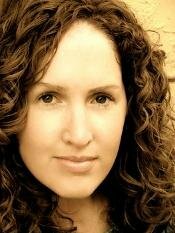 She is the author of the bestselling HUSH, HUSH Saga. HUSH, HUSH and CRESCENDO are in stores everywhere now! SILENCE will be released worldwide on October 4, 2011. **Sorry again, I haven't been posting much, but I'm hoping to be posting more now!